Flowers in the hair have been around for decades, even more. It is considered a classic, but suddenly we have seen an uprise in the trend on the runway as well as the streets. To don this look, it is not always possible to visit your florist first to get your hands on a beautiful flower. Neither can we pluck flowers from our own home gardens; they are like our babies right. 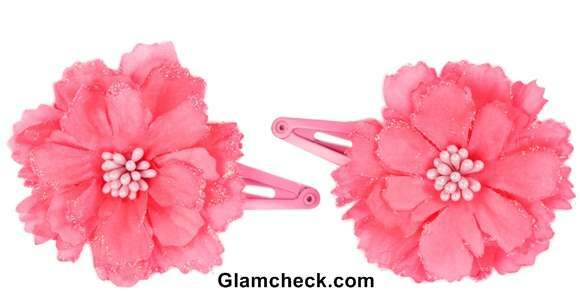 So here is the deal our today’s accessory must-have is flower clips. They are hassle-free alternatives to using natural flowers since not every natural flower can be fixed securely with a bobby pin. They last way longer during the day, without the need to be fixed again. Also they come in great varieties and colors, so that you can match them any dress that you can imagine. Now to find an orange exotic flower to match your new dress would be tough but not the same with a flower clips. So here is everything you need to know before buying a flower clip! Of course there will be an endless variety of colors, sizes and flower types available in a flower clip but the difference apart aesthetics lies in the way it will be fixed to your hair. So with that in mind, here are the different varieties of flower clips that you can find in the market. In the list, the first two can be used on any length of hair and pretty much any hairstyle. The next two will require a pony-tail, the next few are best for buns and the last French barrette can be used both in pony, half-tie and buns. Now once you know all the plethora of options that you will find in stores it is time to discuss how and where can you don them. Put a flower clip in your hair as an accent when you are leaving your hair open and wavy. It will give a feminine twist to your more casual looking open hair. You can also, similarly, add a flower clip to your out-of-the-bed hair. Next time when you tie a side pony tail, give your regular hair tie, scrunchie or elastic a miss. Instead opt for a flower hair tie and see your look change instantly. For an evening or a gala event you can also straighten your tresses out and half tie them. Use a flower clip for the same for a simple yet glamorous updo. Other options for wearing flower clips in a bun. Be it a classic chignon or a trendy side braided bun, you can use flower clips for most of the buns. As for, where to wear this style – depending on the hairstyle you can wear it during the day as well as evening (as explained above) If it is a pronounced hair-clip we would not suggest it for most work environments. But for beach holidays, luncheons, dinner, dates, running errands etc. why not! Now if you thought, you could only style one flower clip at a time, we say get creative and have a look at this! 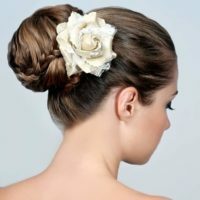 Try tying your little bun with pearls and use a comb flower clip on top. 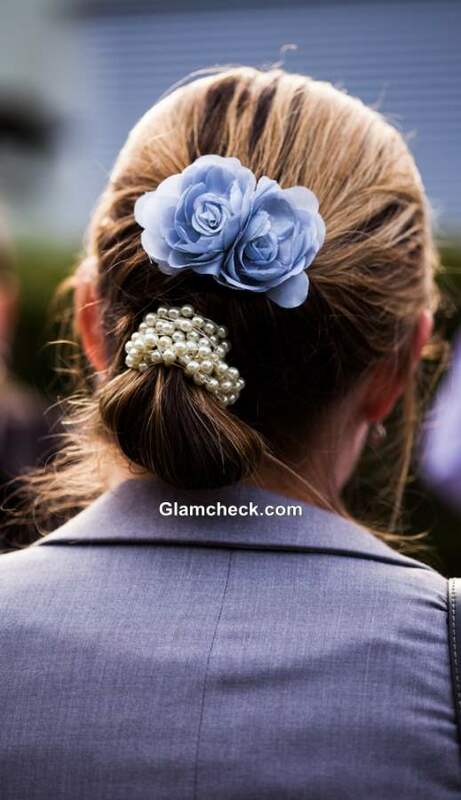 Really classy and eye-catchy; tell us how much you love this idea! The next styling idea comes from the runway and it is bold with a capital B. Use two big flower clips at once! Only be cautious to either use similar colors. To twist the very same look, use a small flowers a big one to create a bunch like appearance. With the second idea you can also use three flowers instead of two. The final idea is white on white. 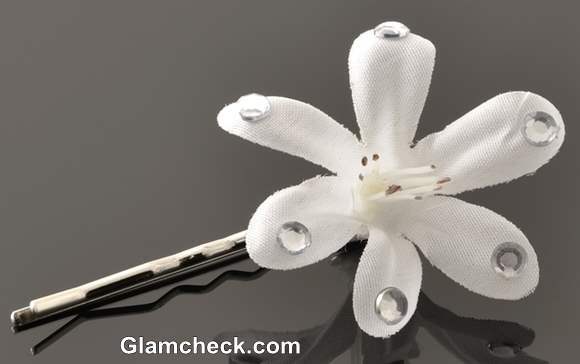 Try a white flower clip with a white maxi and feel like a goddess. Our editors know that this combination will fetch you so many compliments that we had to include it. So all that said, what are your plans? 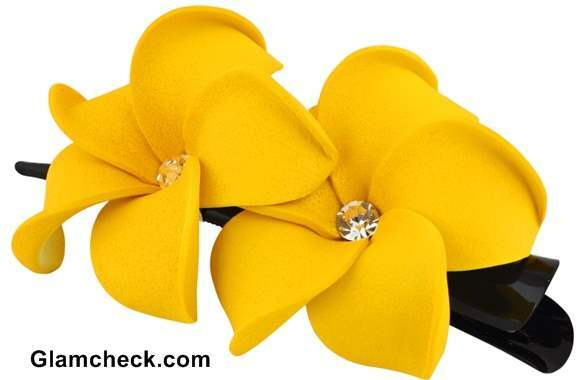 Already searching e-sellers for flower clips or have you noted them down in your shopping list? Either way go rock them girl!